Posted October 7, 2016 by Brassica Contributor & filed under Coffee, Detoxification, Glucoraphanin, Recipes, Uncategorized. 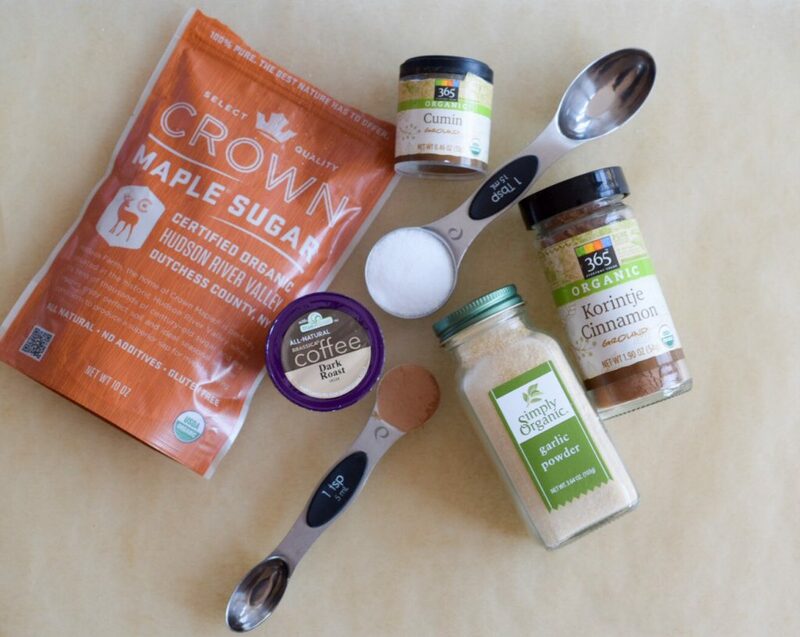 Are you craving a light yet satisfying dessert that also includes key nutrients for detoxification? Look no further as we are sharing the latest recipe from Amy Fischer RD (@thegreenfisch) that features our new Brassica® Coffee with 15 mg of glucoraphanin from broccoli. 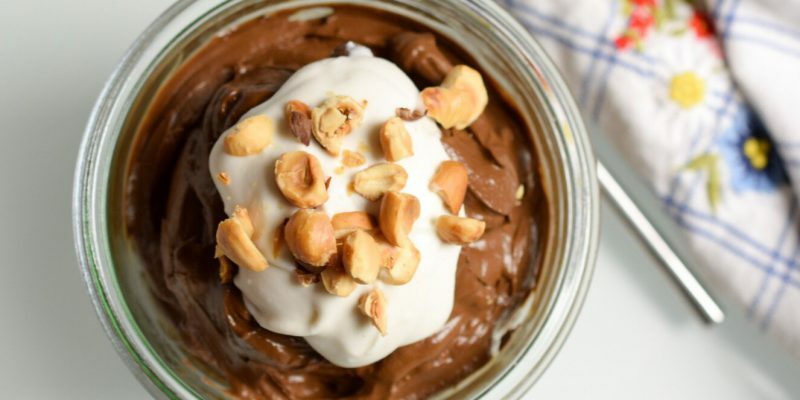 We promise this mousse tastes nothing like broccoli, and you’ll get the added detoxification health benefits of this mighty cruciferous vegetable. You can use the light roast or dark roast for this recipe – we went with the dark roast. The best part? There are only seven ingredients and two steps! 1.) 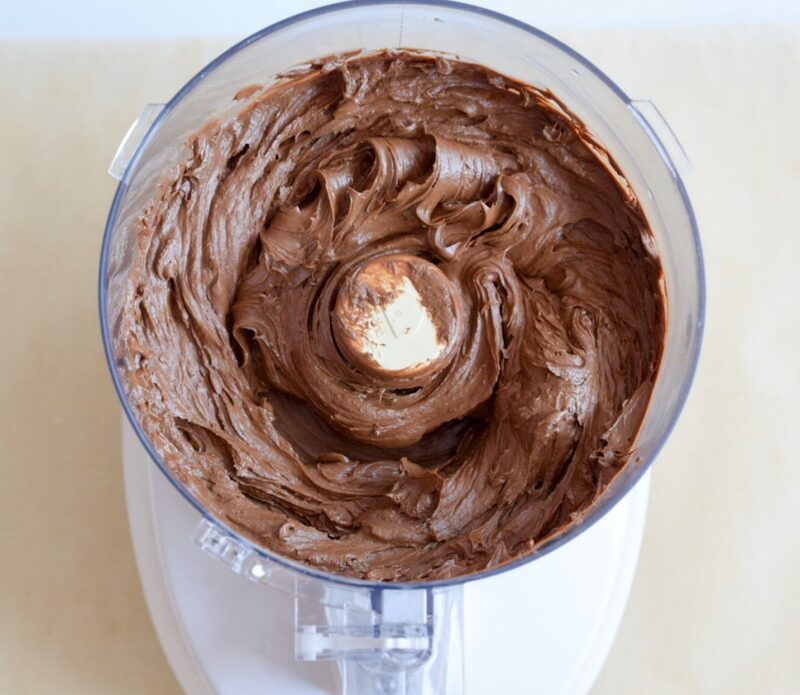 Combine all ingredients in a blender and blend until the texture is smooth and creamy. 2.) Serve chilled and top with whipped cream or coconut cream and roasted nuts. Posted September 5, 2016 by Brassica Contributor & filed under Broccoli, Detoxification, Featured, Glucoraphanin, Myrosinase, Recipes, Uncategorized. It’s Labor Day! As you prepare to spend time with family and friends, fire up the grill and put refreshing drinks on ice, don’t be afraid to prepare delicious and healthy food that will wow your guests and deliver a kick of detox to your body. 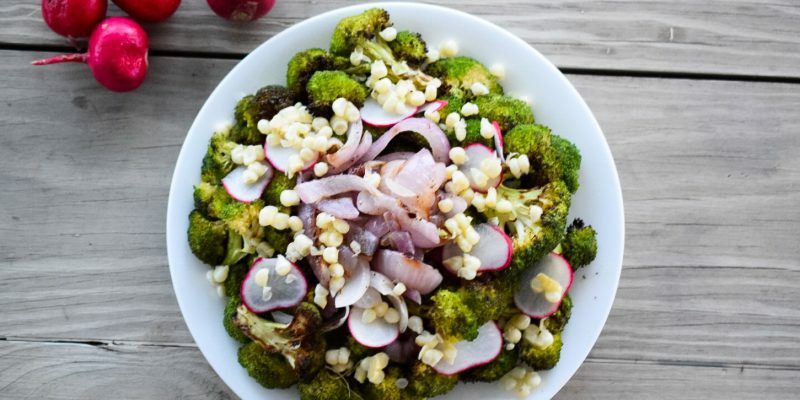 The broccoli and radishes in our new Grilled Broccoli Salad recipe (thank you Amy Fischer, RD – @thegreenfisch) work as a team to help prepare the body for true detoxification. Broccoli florets feature the powerful phytonutrient glucoraphanin and the enzyme myrosinase, which work together to convert glucoraphanin to the potent antioxidant sulforaphane. Radishes are also rich in myrosinse. Glucoraphanin is converted into sulforaphane via the enzyme myrosinase. This happens when we chew broccoli and break down the cells. Caution – myrosinase will be denatured when cooking. If this occurs, the conversion will take place via the body’s gut microflora, which is the same process if you are consuming glucoraphanin through a fortified food, beverage or supplement. 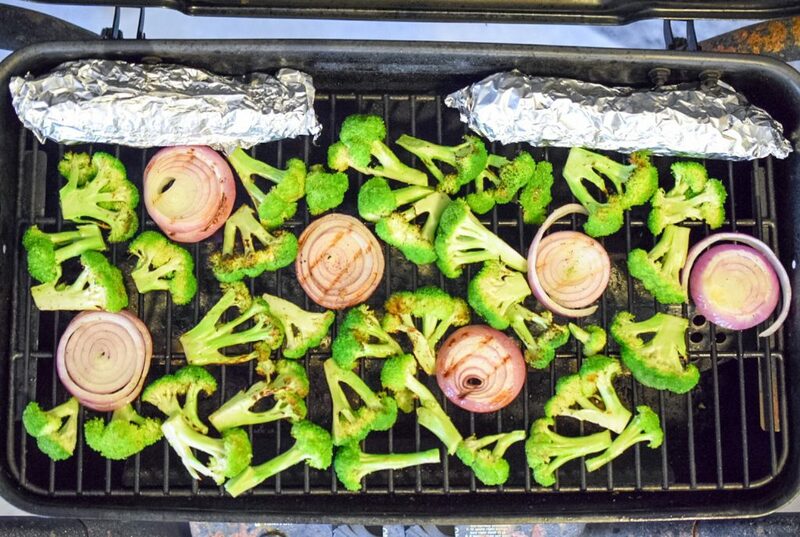 Try our latest broccoli recipe…on the grill this Labor Day! On a clean grill, coat grill rack with olive oil. Slice broccoli horizontally into medium thick slices. Cut red onion into thick slices. Grill corn in or out of the husk directly on grill or wrap it in aluminum foil and place on edge of grill. Brush vegetables lightly with olive oil on both sides to coat and season with salt and pepper. 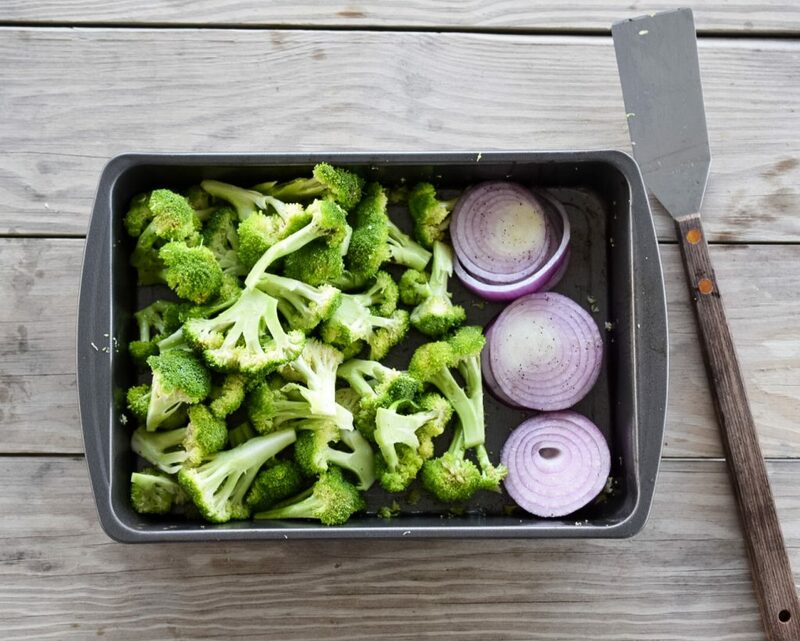 Place broccoli, onion and corn on heated grill and cook at medium to low temperature turning frequently to avoid burning. Cook for approximately 5-10 minutes and remove from heat. Mix vegetables together and drizzle lightly with balsamic. Using a mandolin slice the radish over the salad and serve warm or chilled. Serves 4. Posted July 21, 2016 by Brassica Contributor & filed under Broccoli, Detoxification, Featured, Glucoraphanin, Recipes. Do you need breakfast inspiration? Or, maybe you’re preparing for vacation and you want an easy “make ahead” breakfast option that can be reheated quickly, tastes great and packs a punch of nutrition? 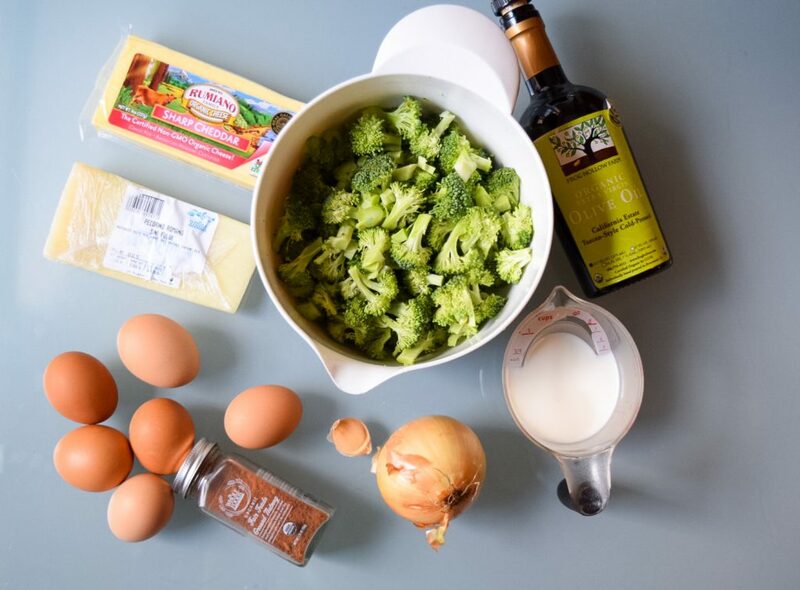 Try this mini crustless broccoli quiche recipe created by registered dietitian Amy Fischer (@thegreenfisch). Pair the quiche with a cup of Brassica Tea with 15 milligrams of glucoraphanin from broccoli. Glucoraphanin – while a tongue twister – is a mighty antioxidant found at the highest levels in broccoli. It optimizes the body’s detoxification systems, helping to eliminate toxins and environmental pollutants from the body. Glucoraphanin is converted into the phytonutrient sulforaphane via the enzyme myrosinase (also found in broccoli). This happens by chewing and breaking down the cells, resulting in the distinct taste (sulfur-like) of broccoli. Or, the conversion will happen in the body’s gut microflora, which is the same process used if you’re consuming glucoraphanin via a fortified food, beverage or supplement. Preheat oven to 350 degrees. Heat oil in a large nonstick skillet over medium heat. Add onion and garlic; sauté for approximately 1-2 minutes. Add broccoli florets and sauté for approximately 2 minutes; add a pinch of salt and pepper. Remove from heat. 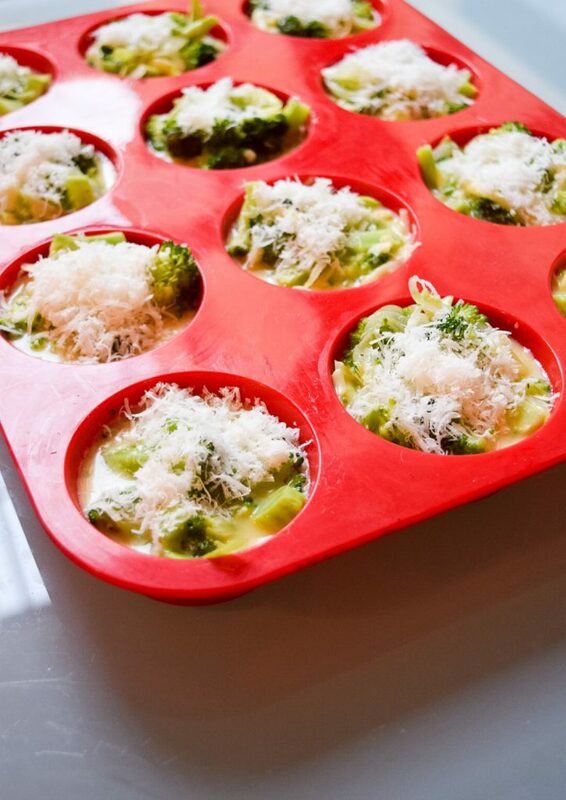 Coat muffin tin lightly with olive oil or use a silicon muffin pan and spoon broccoli mixture evenly into muffin tin. In a medium bowl combine and beat eggs, egg whites, cheddar, milk, nutmeg, ½ tsp. salt and pepper. Pour mixture evenly over broccoli mixture and then top with grated pecorino romano. Bake at 350 degrees for approximately 30 minutes or until a knife is inserted and comes out clean. Enjoy! Posted July 12, 2016 by Brassica Contributor & filed under Brassica, Coffee, Glucoraphanin, Recipes. Do you love coffee and granola, but never thought about mixing the two? 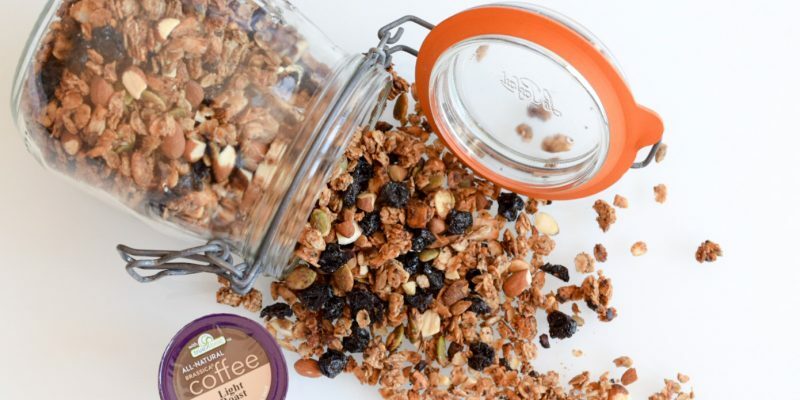 We’re here to share our latest Brassica Coffee Mocha Peanut Butter Granola recipe developed by registered dietitian Amy Fischer (@thegreenfisch). It’s the best of both worlds in a bowl, in your yogurt or in the palm of your hand. 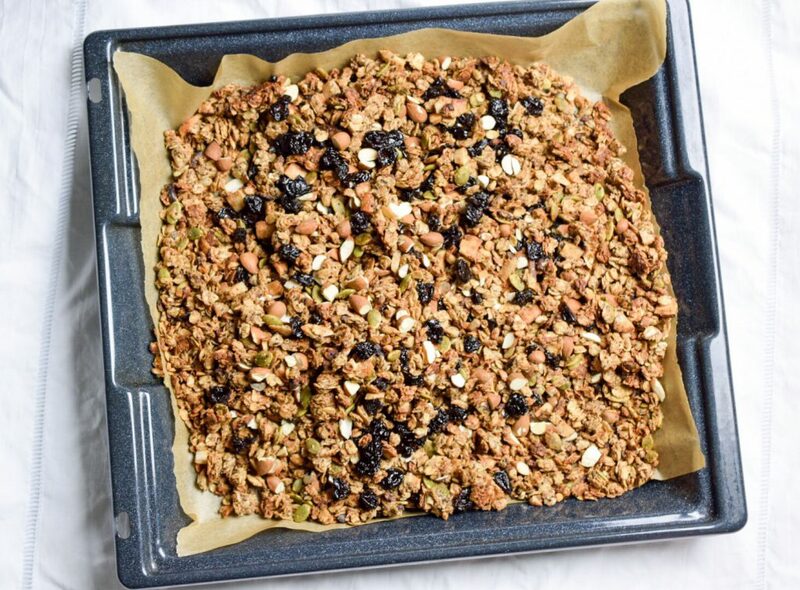 Get out of your breakfast slump with this delicious and easy granola recipe. It’s a perfect on the go snack or breakfast pick-me-up. If you haven’t tried our new Brassica Coffee with 15mg of TrueBroc® glucoraphanin, get yours today at our online store. 1.) Preheat oven to 350 degrees. Line a baking sheet with unbleached parchment paper. 2.) 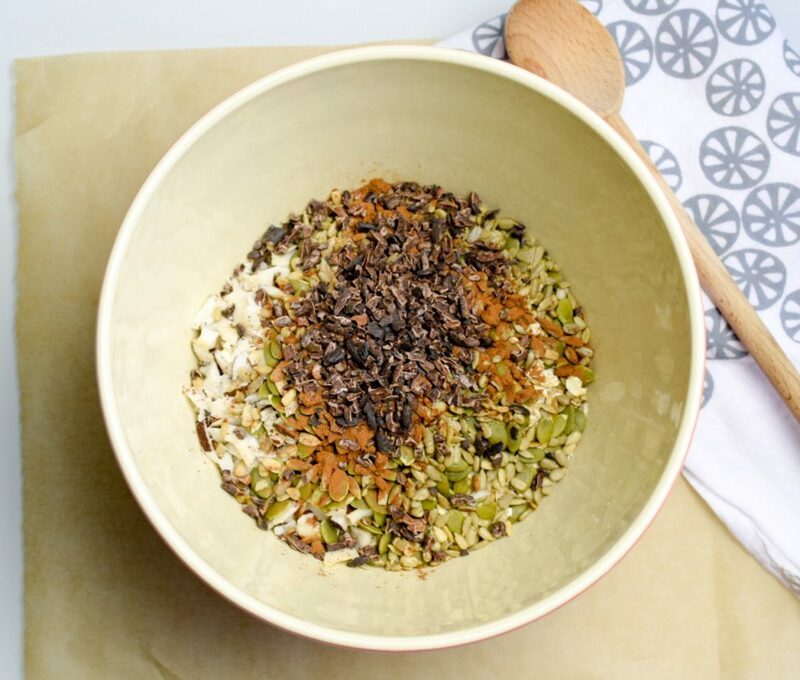 In a large bowl combine oats, coconut flakes, sunflower and pumpkin seeds, cacao nibs, cinnamon and salt. 3.) In a small bowl combine maple syrup, honey, peanut butter, Brassica Coffee and vanilla (if using solid honey, you may want to place over very low heat first to make it easier to blend). Mix well until thoroughly combined. Add peanut butter mixture to the oats and stir well until oats are coated. 4.) Place mixture on lined baking sheet and spread out covering the pan. Bake for approximately 30 minutes or until golden brown. Add almonds and cherries, mixing in well and let cool. Once cooled the granola will become crunchy. Store in an airtight container. Posted June 21, 2016 by Brassica Contributor & filed under Brassica, Coffee, Health, Recipes. It’s summer, your glass is filled with fresh brewed iced tea and your grill is fired up to cook your family a delicious meal. Reach for your Brassica Coffee K-Cup® pod and hold on to your taste buds. 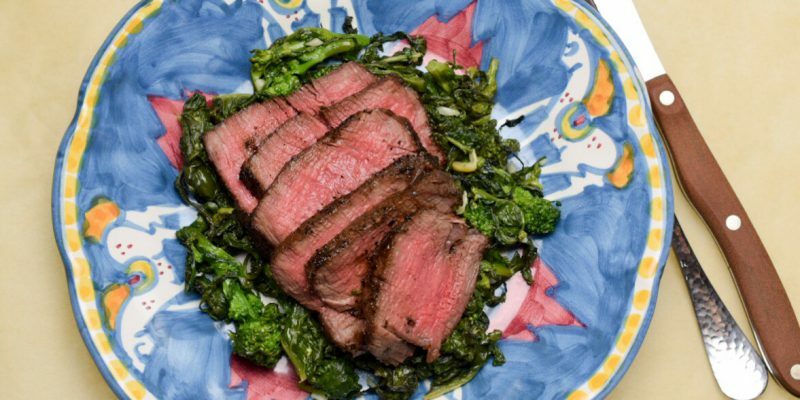 We have a new recipe from our friend Amy Fischer RD (@thegreenfisch) who incorporated our Brassica Coffee with TrueBroc® glucoraphanin into an amazing rub for your favorite protein (chicken, fish, beef, pork). Brassica Coffee delivers 15 mg of the powerful antioxidant glucoraphanin from broccoli. When consumed, glucoraphanin helps to trigger antioxidant action lasting up to 72 hours, compared to other antioxidants that typically last only 3 hours. 1.) In a sm all bowl combine all ingredients (except for the meat) together well. 2.) Lightly coat each piece of tenderloin (or protein of choice) with olive oil and then rub approximately 1 tbsp. of mixture onto the meat. Let sit for approximately 1 hour at room temperature, covered, to absorb the spices before cooking. 3.) Keep any leftover rub mixture in an airtight container for ~2-3 months. 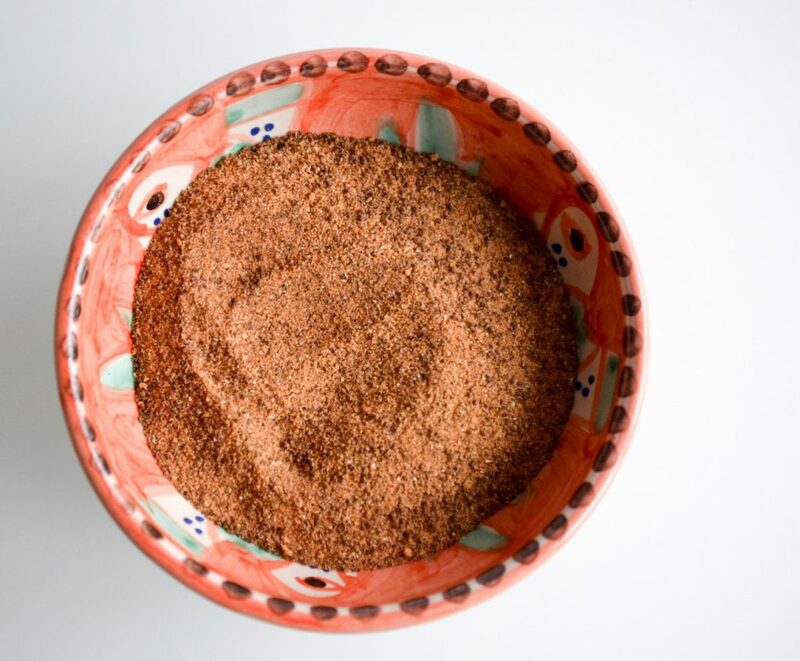 Share photos of your Brassica Coffee rub recipes that you create. We’d love to see them and profile them on our blog. Posted May 24, 2016 by Brassica Contributor & filed under Broccoli, Detoxification, Glucoraphanin, Health, Recipes. 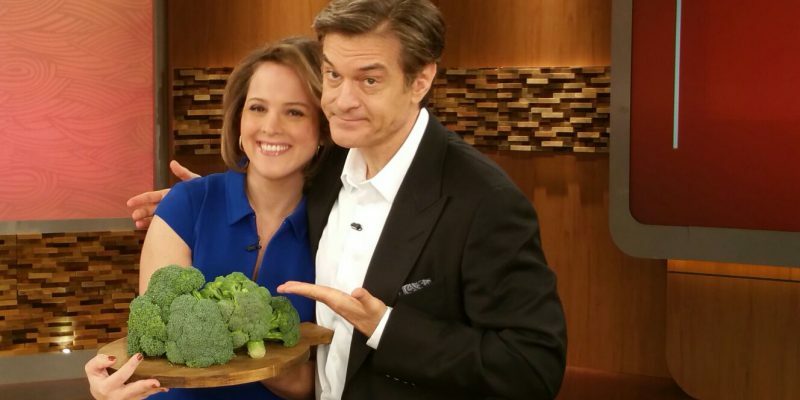 We caught up with award-winning nutrition expert Ashley Koff, RD, creator of the Better Nutrition Simplified Program to learn more about her recent appearance on the Dr. Oz Show and why broccoli is her favorite vegetable. TrueBroc®: You recently professed your love for broccoli on the Dr. Oz Show. What is it about broccoli that you love so much? Ashley Koff, RD: I was that “strange” kid who always loved eating broccoli. As a kid, I liked the taste and the brightly colored little trees. When I became a registered dietitian, I was excited to learn about all of the important vitamins, minerals and phytonutrients that are packed into my favorite food! TrueBroc®: What part of the broccoli has the most abundant supply of nutrients? Ashley Koff, RD: Let’s be clear, all of broccoli is good for you. The leaves and the stem have different nutrients and amounts of nutrients than the florets. So I think rather than ask what part has the most abundant supply, I would highlight why I love the leaves (calcium), the stems (fiber) and the florets (lots of vitamins but also the super detox hero, glucoraphanin, that I told Dr. Oz about – that’s where you find the most of it, and broccoli florets have more glucoraphanin than any other food). TrueBroc®: You mentioned during the show that broccoli is great for detoxing. Why is it such a good detox food? Ashley Koff, RD: So first off, I think it is key for us to be reminded that we all have a detoxification system – the body’s equipped to identify and remove toxins. Thus, the foods that contain the nutrients that support that system – both phases of it – are a major part of our nutrition needs. For example, to convert harmful toxins and used hormones (which can become harmful if not eliminated) into less harmful ones, the body needs lots of vitamins and minerals like B vitamins, magnesium as well as plant nutrients like milk thistle and quercetin to support these efforts. Antioxidants found in colorful fruits and vegetables, as well as the plant nutrients in nuts, seeds, grains and beans that help do the “clean up” work. Broccoli contains the highest amount of the phytonutrient glucoraphanin, which the body uses as a key detox agent – especially for the second part – to convert and eliminate those tough toxins and used hormones. TrueBroc®: If people don’t eat broccoli, are there other ways to get the detox benefits of its glucoraphanin? Ashley Koff, RD: Absolutely. 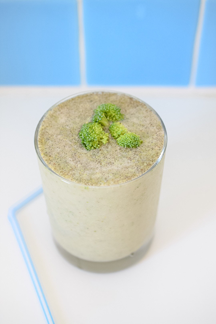 You can blend broccoli into your morning shake or smoothie to help mask the sulfur/bitter taste (my friend Tess Masters, aka The Blender Girl, recommends frozen as it virtually eliminates the broccoli taste). 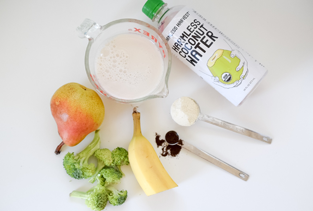 Also, a friend and fellow registered dietitian, Amy Fischer (@thegreenfisch) developed this broccoli protein smoothie recipe. Enjoy! 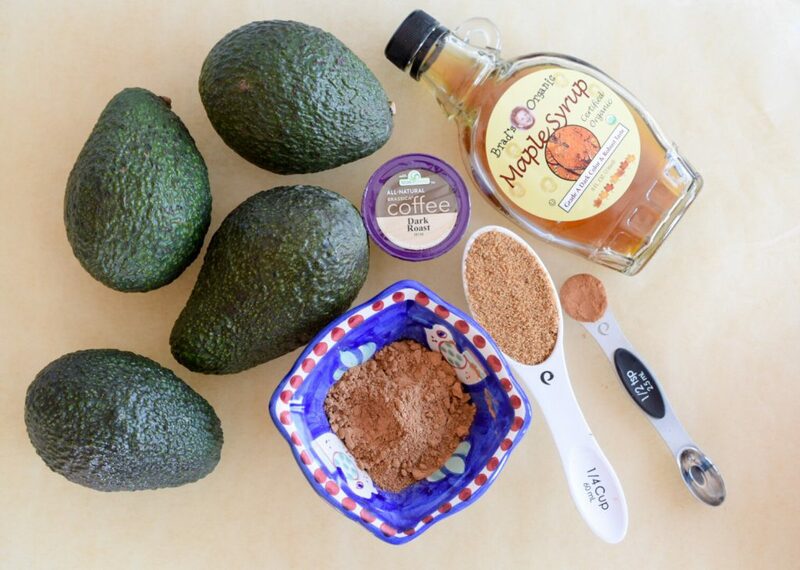 Add all ingredients to high-speed blender and enjoy. Optional: add ice. Posted May 12, 2016 by Brassica Contributor & filed under Brassica, Coffee, Detoxification, Glucoraphanin. Brassica Protection Products LLC, an innovator in the research and development of nutritional ingredients derived from cruciferous vegetables, today announced the launch of its new Brassica® Coffee with TrueBroc® glucoraphanin from broccoli seeds. 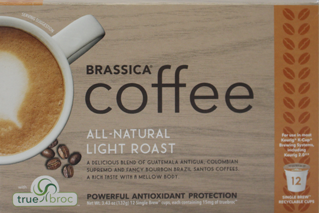 Brassica Coffee is available in light and dark roasts containing 15 milligrams of TrueBroc® in each K-Cup®. The coffee is available for purchase at truebroc.com, Amazon.com and Baltimore Coffee and Tea in Baltimore, MD. Brassica Coffee is available in all-natural light and dark roast coffees. Brassica Coffee light roast features a blend of Guatemala Antigua, Colombian Supremo and Bourbon Brazil Santos coffees. The dark roast variety delivers a blend of French roasted Central American, South American and African Arabica coffees. 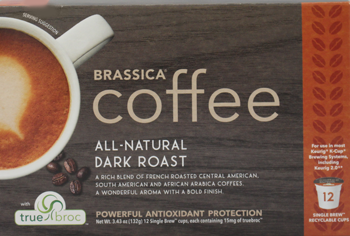 The manufacturer’s suggested retail price (MSRP) for Brassica Coffee is $10.69 per box of 12 K-Cups. To celebrate the launch of Brassica Coffee, we are offering free shipping on all orders over $20. Simply enter coupon code bcfee16 at checkout and shipping is on us. Offer is available through May 2016. Shop Now. Posted April 5, 2016 by Brassica Contributor & filed under Detoxification, Glucoraphanin, Recipes, Tea, Uncategorized. The weather is warming up. 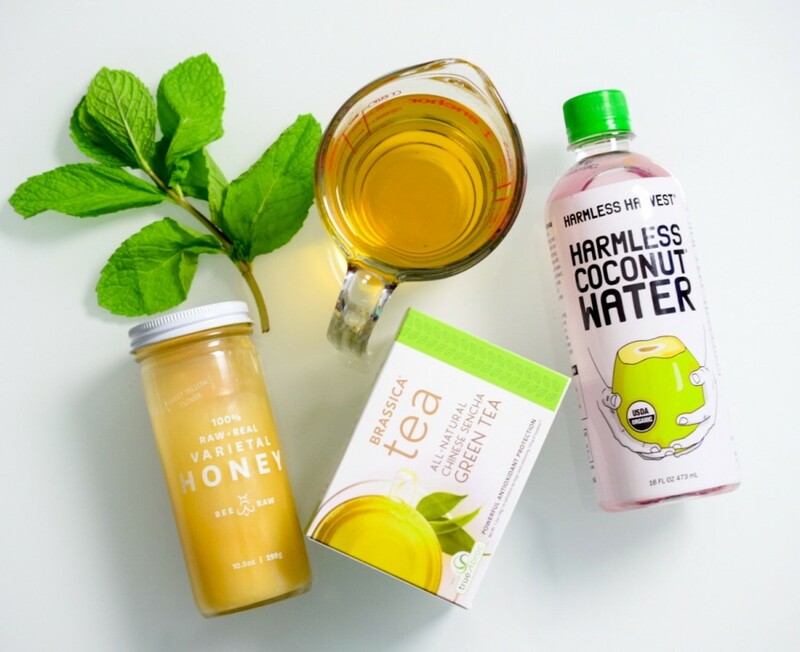 As you shift from starting your day with a warm cup of tea to an iced treat in the afternoon, we encourage you to try our new Iced Coconut Brassica Tea recipe. 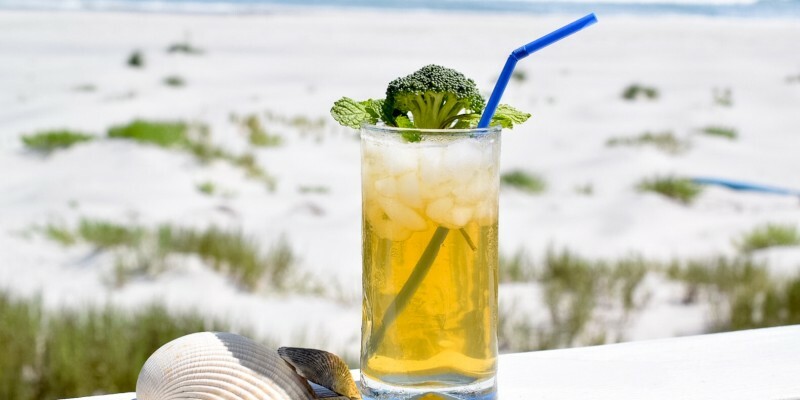 One Brassica Tea bag contains 15 mg of the mighty phytonutrient from broccoli – glucoraphanin. Enjoy this tea knowing that you’re helping to boost your body’s natural detoxification systems. Recipe and photos courtesy of Amy Fischer, RD (@thegreenfisch). Tranquil beach scene not included with recipe. Posted March 11, 2016 by Brassica Contributor & filed under Glucoraphanin, Health, Recipes, Tea. Do you love drinking a cup of Brassica Tea in the morning? If you enjoy it in the morning, then you’ll be excited to hear that you can enjoy it in your dinner entrée too. 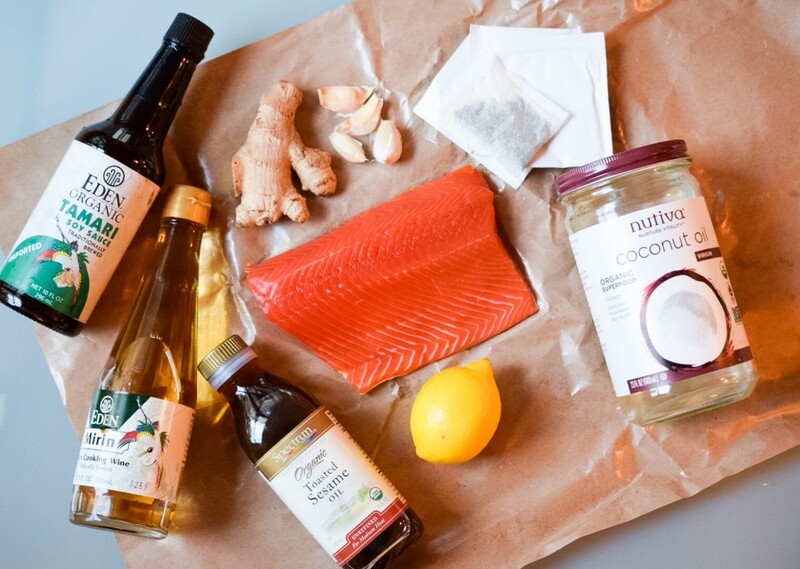 Registered dietitian, Amy Fischer, created this Brassica Tea poached salmon recipe. Each tea bag includes 15 mg of glucoraphanin from broccoli to help boost your body’s natural detoxification pathways. Visit our tea store to purchase Brassica Tea with TrueBroc® in a variety of flavors – even decaf. Follow us @truebroc and Amy Fischer @thegreenfisch. Directions: Add water to a large pot and bring to boil, add 4 Brassica Tea bags, turn down heat to lowest setting and let tea bags steep for approximately 5 minutes, squeeze teas in water and then discard. Add garlic, ginger, mirin, tamari and 1 tsp. honey. In a separate large skillet, heat coconut oil over medium heat. Add salmon and sear on each side for about 3 minutes. 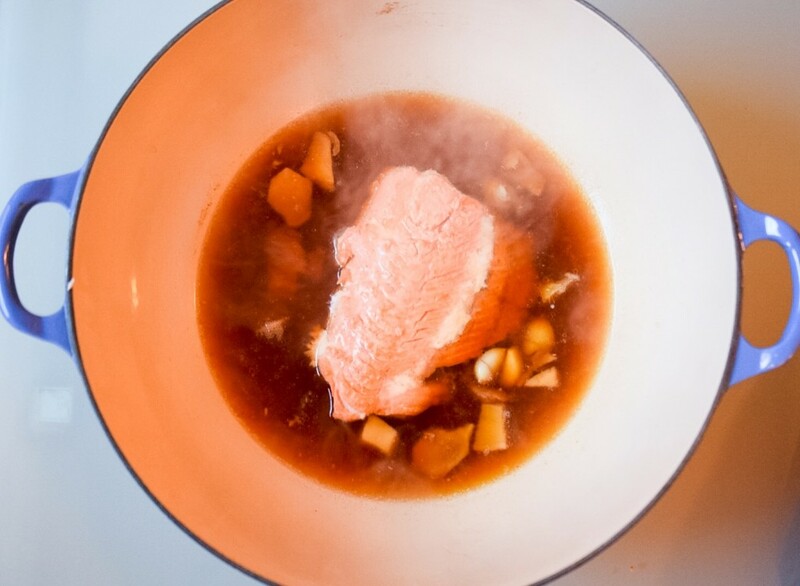 Transfer salmon to the large pot with Brassica Tea to poach in liquid. Let sit for a couple of minutes or until salmon flakes easily. 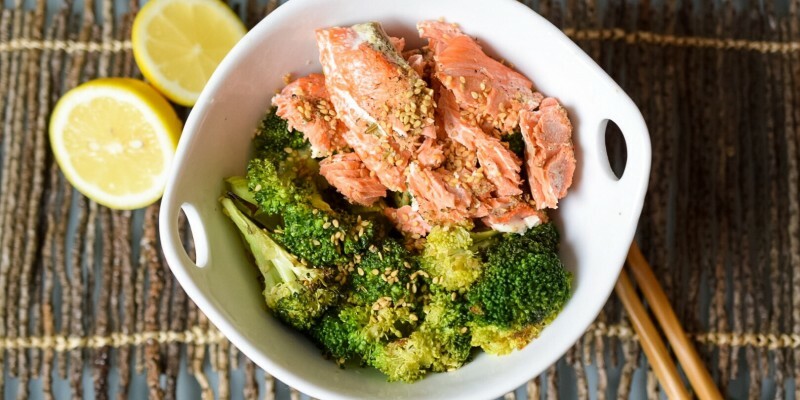 Remove and serve with roasted broccoli and top with gomasio and lemon. Serves 4. Posted January 29, 2016 by Brassica Contributor & filed under Broccoli, Detoxification, Glucoraphanin, Health. Our nutrition consultant – Ashley Koff, RD – shares one of her top nutrition tips with the Sharecare team. This tip will set you up for success throughout the day. The best part? 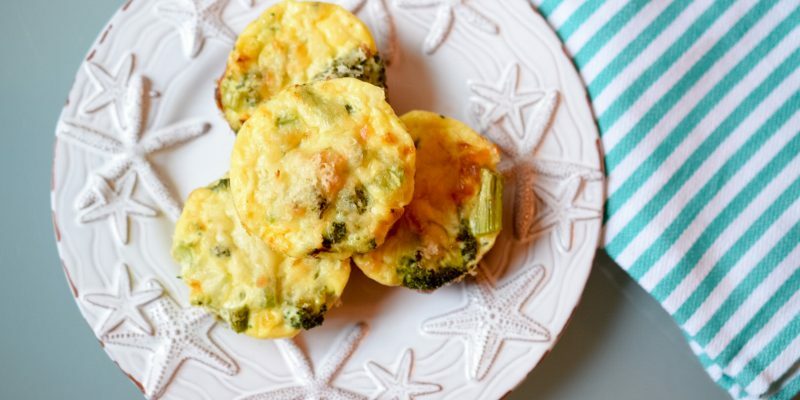 It features broccoli – whether it’s pureed in a juice, added to an omelet or baked in a muffin. Year of You: Ashley KoffDietitian Ashley Koff Approved has a Year of You tip that gets you started on the right path first thing in the morning!